In my post about Imogene’s Antlers the other day, I mentioned how rare it is to find a book that can make your kid really laugh out loud. It’s fairly easy to find your kid a book where, upon reflection, they’ll say, “yeah, that’s a funny book.” But finding a book that inspires pure, spontaneous laughter, those titles are few and far between. That being said, Interrupting Chicken by David Ezra Stein doesn’t just make my daughter laugh, it makes her lose her mind. Honestly. She goes bonkers for this admittedly very, very funny picture book in a way that I’ve never seen her react before. And the funny thing is – Interrupting Chicken should be an ideal bedtime book. It’s about a father chicken trying to put his young daughter down to sleep and read her a final bedtime story, but, as the title suggests, she keeps interrupting him. It’s a book built around the bedtime ritual, so, originally, I thought this would be a perfect new bedtime book for our family. I was WRONG. I find I can’t read Interrupting Chicken to my daughter at bedtime anymore because it has the opposite effect of a good bedtime book – it actually wakes her up. It doesn’t just wake her up. It makes her hyper. She loves it SO much and she’s created such a weird, funny little ritual surrounding the book that, while we read it, she becomes such an active participant that she freaks out a little bit. Which, don’t get me wrong, is HILARIOUS to witness. However, when it’s already past 8:00 pm and it’s a school night, it gets to be a bit much. 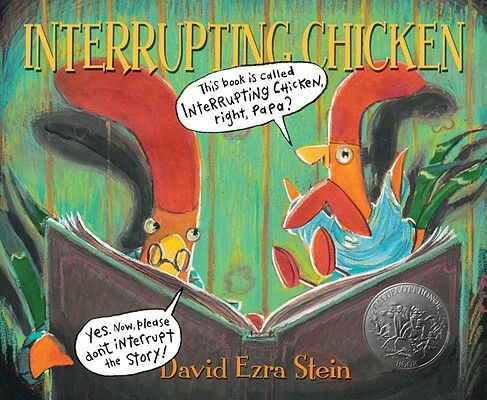 So, full disclosure, Interrupting Chicken is a book about bedtime that we only read during daylight hours at the moment, but it is still one of our favorite semi-recent additions to our home library. This is the first David Ezra Stein title that our family has read, and he’s a major talent, both as a writer and as an illustrator. 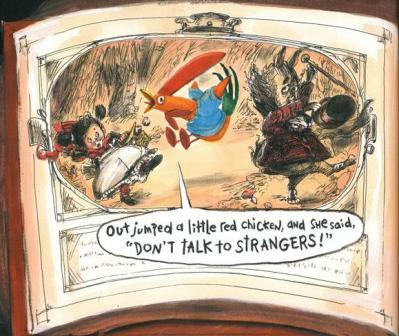 Interrupting Chicken has a fantastic visual style that brings together various different mediums – the main spreads with the chicken and her father are watercolor paintings with a great palette of reds, greens, and browns; there are sepia-toned storybook pages interspersed throughout the story; and we even get the chicken’s own attempt at making her own picture book that’s illustrated in crayons. The sheer design of the book is really impressive. Her response is hysterical, but also totally believable to any parent who’s ever read their child a fairy tale where ominous things are on the horizon and found themselves hit by a barrage of questions and concerns about the welfare of the main characters. Only this interrupting chicken has taken it one step further and actually just edits the story herself to make sure that nothing horrible happens to the heroes of the story. Papa Chicken gently scolds the little chicken for interrupting and asks her, “Try not to get so involved… You’re supposed to be relaxing so you can fall asleep.” The little chicken apologizes and asks for another story, running through the exact same routine with Little Red Riding Hood and Chicken Little. And her attitude is fantastic – she just can’t BEAR to see these fairy tale creatures make such horrible mistakes, so, even though she promised her Papa, she just HAS to jump in and save the day via a loudly screamed editorial adjustment. These interruptions are the parts of the book where my daughter goes absolutely mental. Like the chicken, she insists on screaming out the storybook fixes at the top of her lungs and, more often than not, jumps up and down while screaming them out. She actually screams them so fast and furious that, if you hadn’t read the book yourself, you’d have NO idea what my daughter was saying. Her delighted shrieks are pretty much unintelligible as she bounces up and down, ranting and laughing at top volume, until she reaches “THE END!” It’s incredibly funny… but, yeah, not at 9:00 pm. At the end of Interrupting Chicken, Papa Chicken turns the tables on his daughter, asking her to tell him a story. 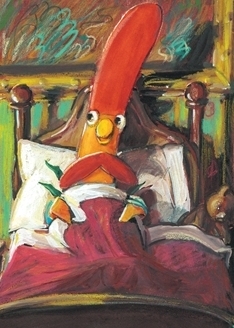 His little chicken quickly puts together a crayon-drawn picture book called “Bedtime for Papa”, which, the now-exhausted Papa interrupts with his snoring. The going-to-sleep ending is very sweet and very funny, but, again, the earlier pages are so explosively funny, I simply can’t read it to my daughter too late at night. Poor me, eh? Your kid SO enjoys a book, that they’re SO completely amused with it and consumed with it, that it makes them a little slap-happy. What a great problem to have. AGE RANGE: Four and up. But the bedtime experience it describes is universal enough to entice younger kids and the sheer funniness of its execution will make it popular with older kids too. AUTHOR WEB SITE: DavidEzra.com is a pretty cool site – though I wish the navigation menu was at the top of the page on the main landing page rather than at the bottom. You’ll find info on the books, on personal appearances, and Stein gives some great instructions on how to make a “snappy” book of your own that your kid can fill in with their own words and drawings. BUY IT, BORROW IT, OR FORGET IT? : My instinct is to tell you to buy it, if only because it elicits such a great response from my own kid. But this is a book that really lives or dies on how well you read it aloud, so a library trial might not be a bad idea, if reading aloud isn’t your thing. Don’t Let the Pigeon Drive the Bus, by Mo Willems – OK, this isn’t just because both books have bird protagonists (though it helps). Don’t Let the Pigeon Drive the Bus is one of the best call-and-response picture books that I’ve ever read. It inspires an amazing level of participation from its audience and it’s so much fun watching kids scream “NO!” at the Pigeon’s requests to drive the bus. My experience reading Don’t Let the Pigeon Drive the Bus with my daughter reminds me a lot of my experience with Interrupting Chicken. They’re two of the only picture books that have ever inspired my daughter to literally SCREAM at the printed page, which is awesome. Duck! Rabbit! by Amy Krouse Rosenthal, illustrated by Tom Lichtenheld – I recommended this as a readalike for Willems’ Elephant and Piggie series, but I think it works here too. Like Interrupting Chicken, Duck! Rabbit! inspires a lot of interactivity with its audience and has a similarly clever premise and execution. Chester by Melanie Watt – Chester is a really fun picture book that, like Interrupting Chicken, involves dueling narrators editing the story as it goes. Chester is definitely more madcap and less sentimental than Stein’s book, but it definitely plays with storytelling in similar ways. In the book, Melanie the author is trying to write a picture book about a cat and a mouse, but Chester the cat has swiped a red marker and uses it to change the story and constantly mock both his creator and his mouse co-star. (Chester’s bad behavior catches up with him in the end.) There are moments in Chester that are a little too cluttered and frantic, but, on a whole, it’s an entertaining read. Next post: Do You Have the Right Kind of Interrupting Chicken?